The discovery was made by a passer-by on Sunday January 27 at a playing field off Woodway Lane. 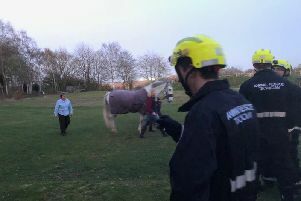 They contacted the RSPCA, who then sent Inspector Helen Smith to the scene. She found the body of a four-foot-long snake in a bin liner and a five-foot snake which was lying on the grass. At this stage it is not known if they were dead when they were dumped but it is suspected they could have been alive and perished in the cold. She believes they were abandoned sometime on Saturday night into Sunday morning. Inspector Smith said: “Either these snakes were dead and someone decided to dump their bodies or they were alive when the owner decided to get rid of them. “It just seems too much of a coincidence that both snakes would have died naturally around the same time so I suspect they were alive when they were left. “The larger one appears to have been moving away from the bag but it was very cold on Saturday night and they wouldn’t have survived for very long. Snakes aren’t able to regulate their own body temperature so need to be kept at specific temperatures in order to survive. “Both snakes were underweight too so it appears they were not properly cared for. Helen added that it is not unusual for the animal welfare charity to be collecting abandoned snakes. She said: “We believe people are unaware of how much of a commitment these animals are, and once they grow in size they can no longer cope.